Within the past six months, recipes have started popping into my head in a way they never used to. I will suddenly have the thought, “Oooh! Wouldn’t XYZ taste good?” And until I get around to creating XYZ in the kitchen, the thoughts of that recipe haunt my brain. This is one of those recipes. When I first made them, I thought, “Yeah, that’s ok.” I ate one and walked away. And then I needed another. And then a third. They have this addictive quality to them. You don’t think they’re amazing, but they have you coming back for more. I gave some to my friend Melia who dubbed them “Crack Cookies” and the name has stuck. Another friend tried them, and she too refers to them as Crack Cookies. They are a bit on the crumbly side which makes you feel obligated to eat the pieces that break off into the storage container so no one sees the broken pieces. Crack cookies, I tell you. You could leave out the dried cranberries or substitute raisins, but I think the cranberries are part of what’s so good about these. In a large bowl, mix together the dry ingredients. In a smaller bowl, mix together palm shortening, eggs, and vanilla extract. Stir the wet ingredients into the dry ingredients until well blended. 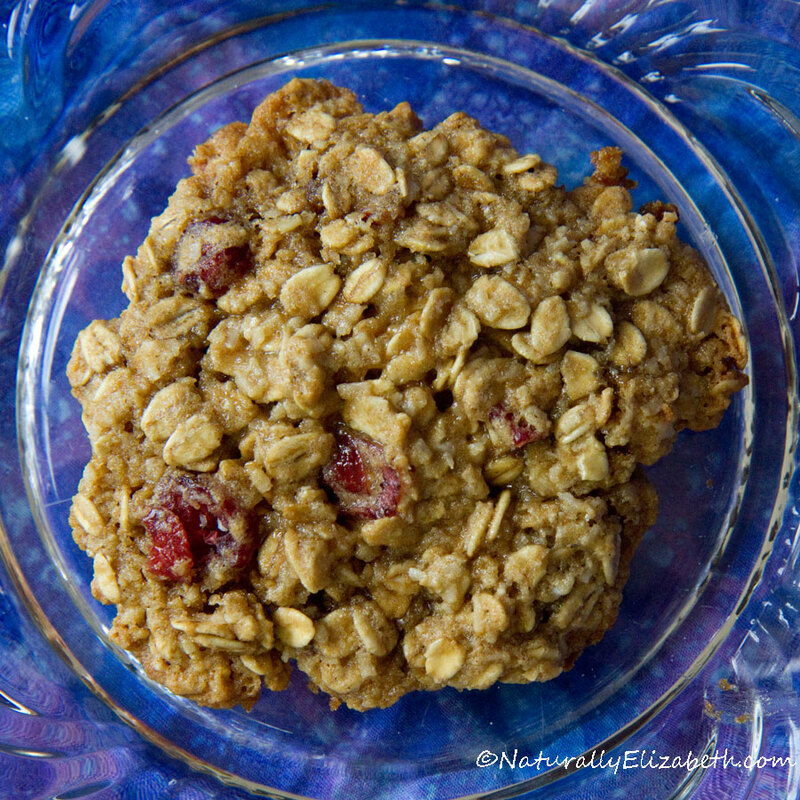 Stir in the oats, coconut, and cranberries. Using your hands, shape the dough into approximately 3” flattened cookies. Place on an ungreased cookie sheet a few inches apart. They will not expand much. Bake for 9-11 minutes at 350F. Cool for a few minutes on the cookie sheet and then transfer to plates or racks to cool completely. Merry 6th of March, y’all. Yes, that is a Christmas serving dish. Because of my health, I can’t host parties the way I used to. I miss it a lot, but it’s something I know will change with time as my health continues to improve. I have several serving dishes, especially Christmas ones, that my kids have never seen since we’ve never had a party at our house in their memories. So last weekend, my kids and I were out at garage sales when we started discussing serving trays. I told them I had a cookie server that had multiple layers, and they wanted to see it. Today I finally figured out which cabinet it was in and pulled it out while these macaroons were in the oven. I’m 99% certain I have another cookie serving tray just like this one but in my everyday pattern instead of the coordinating Christmas one. However, it is probably in the back of a very deep cabinet, and that would have involved getting out a step stool and I just wasn’t willing to make the effort. So the Christmas cookie serving tray came out to both show the kids what it looked like and to serve as the display for this photo. And that’s pretty much how things roll around here. If it’s easier to use a Christmas dish in March than find a plain one, we’ll celebrate Christmas again for a few hours. At least we got the Christmas tree and the stockings taken down before February this year! 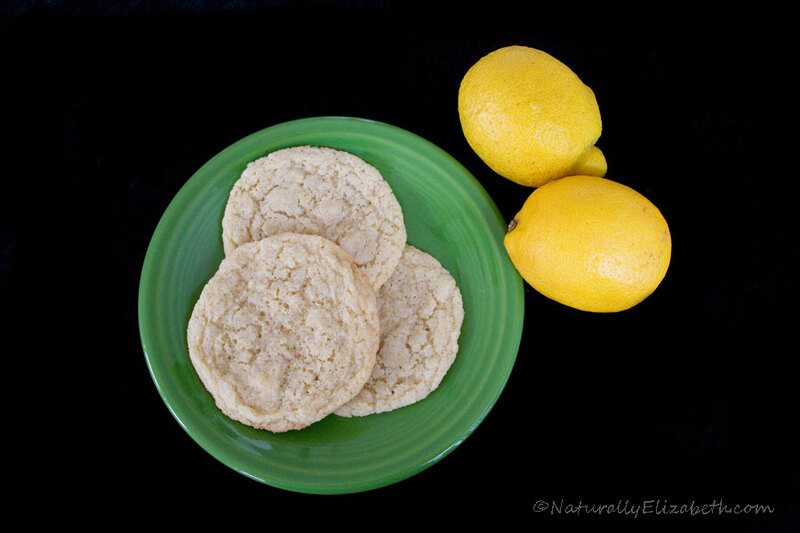 Everyone in the family loves this recipe, including my child with oral sensory issues who doesn’t eat a large percentage of the baked goods I make. That amazes me because as a child, I thought coconut was a food that only grown ups liked. I could not see the appeal. I’m also not a big macaroon fan, but I think that’s because I’ve had so many macaroons that just taste like sugary egg whites. 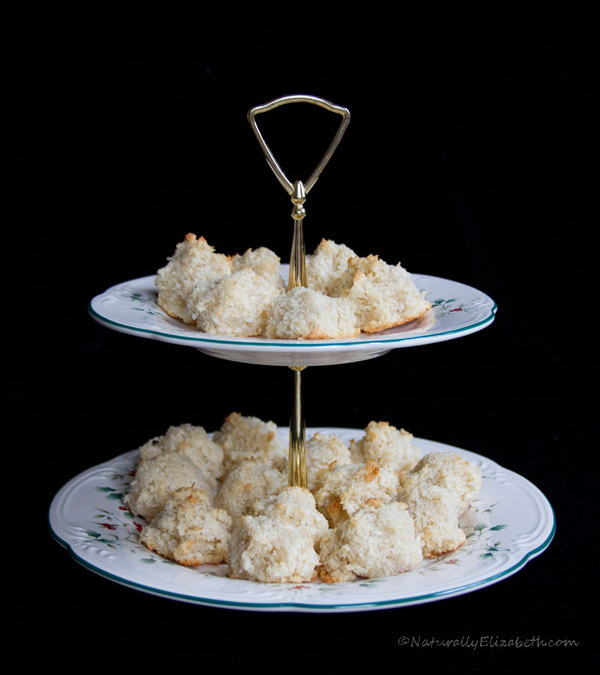 These macaroons are sweet bits of coconut heaven. They go really fast around here. In a small bowl, combine the coconut, sugar, flours, xanthan gum and salt. Stir in egg whites and vanilla; mix well. Form into 1 inch balls and place onto ungreased baking sheets. Bake at 325 degrees F for 18-20 minutes or until golden brown. Remove from cookie sheet to cool.